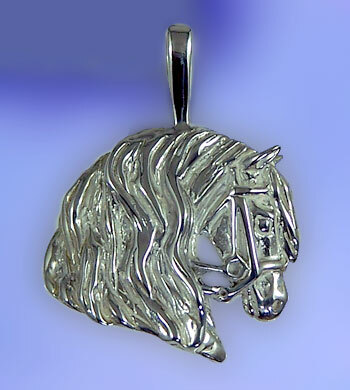 "Friesian Horse Head Pendant in Sterling Silver"
"Friesian Pendant. 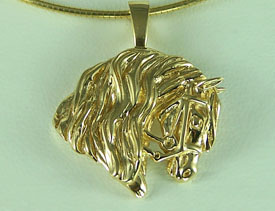 The Gorgeous Horse is your source for custom Friesian jewlery. A nice and heavy piece with exstensive detail in the mane and throughout, this piece is great for everyday wear but will always be a show stopper as well, see it pictured here in Sterling Silver. Be sure to check out all of our Friesian jewelry! Dimensions: 1 inch wide x 1 inch tall. Available in 14kt yellow and white gold and sterling silver.